Contact the Communication for all requests for interviews or information. The FIQ-SISSAT is calling on citizens in the region to sign a letter requesting an investigation into management at the CISSS de l’Abitibi-Témiscamingue. 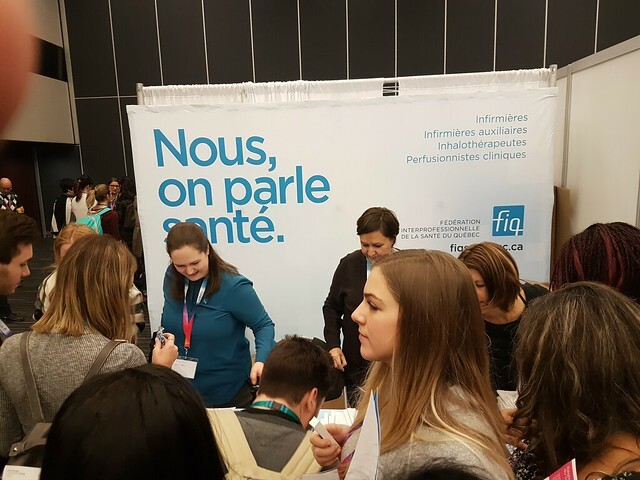 Like every year, the FIQ attended the Annual Meeting of the Ordre des infirmières et infirmiers du Québec. This year, the FIQ booth was particularly busy. Moreover, the delegates showed an marked interest in the Dossier spécial sur les soins sécuritaires (Special Report Safe Care) as well as the Vers le bien-être au travail : une politique pour lutter contre la violence (Towards Well-Being at Work: A Policy for Fighting Against Violence) brochure.